Behind the regal facade of this former newspaper headquarters lies a daring contemporary design that effortlessly blends with the building's original features. 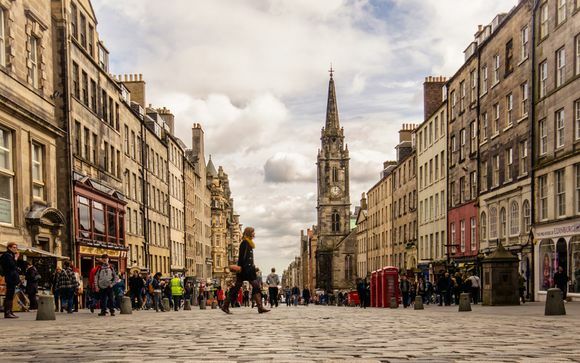 This hotel is perfectly placed for discovering Edinburgh, close to a myriad of shops, delectable restaurants & impressive sights such as Edinburgh Castle - just 15mins away! This hotel is also home to a relaxing spa where you have an exclusive discount - indulge yourself! This is the only hotel in Edinburgh that can boast views over Edinburgh Castle, The Firth of Forth, Leith, Princes Street and Calton Hill. In 2001 this magnificent listed building was transformed into one of the most stylish luxury boutique hotels in the heart of Edinburgh's city centre. The hotel was designed to dominate the Edinburgh skyline and features incredible views of the city´s most famous landmarks. Careful attention has been put towards preserving the magnificent Italian marble staircase as well as the stunning oak panelling, imposing marble pillars and ornate ceilings. 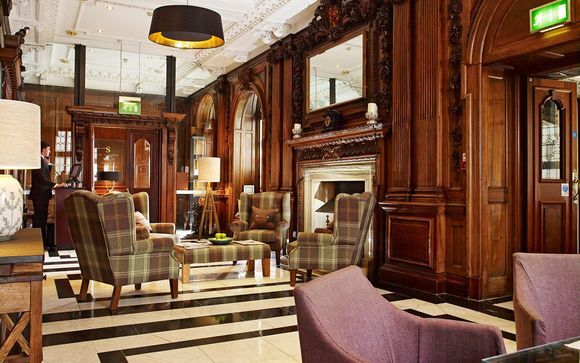 Originally the reception room of the newspaper, the North Bridge Bar and Brasserie features the original oak panelling, a hand carved wooden balcony and imposing marble pillars. The seating area is split into two levels with the balcony offering quieter, intimate seating, with a birds-eye-view below to the buzzing main restaurant and cocktail bar. One of the city’s landmark buildings, the former Scotsman newspaper offices, carefully converted to retain its Edwardian grandeur - oak panelling, marble staircase, baronial turrets - while given a sheen of low-key, modern luxury. Hotel Scotsman enhances its original features with modern influences and impeccable attention to detail. Large windows allow an influx of natural light and guests can unwind upon classic furnishings dressed in tartan linens whilst enjoying state-of-the-art amenities. - Classic Room (34m² / max. 2 persons): The Scotsman Hotel was originally built as the iconic home of the Scotsman Newspaper in 1905, and many of the rooms retain a number of their original features and fittings. - Executive Room (40m² / max. 2 persons): Some of these rooms boast spectacular panoramic views of Scotland's Capital from Princes Street to the Firth of Forth...you won't want to leave! - Junior Suite (52m² / max. 2 persons): With a separate living room, original oak-panelled rooms & spectacular vies of the capital city, these romantic rooms are a destination in their own right! The North Bridge Brasserie serves seasonal Scottish cuisine with a contemporary twist. The restaurant is open every day, morning until night for breakfast, mid-morning refreshments, lunch, afternoon tea and À la carte dining. The Executive Head Chef, Billy Wardclaw serves his seasonal, modern Scottish cuisine with a strong focus on locally sourced ingredients of the highest quality, which he combines with a carefully thought out wine and whisky list.